Handwriting courtesy of my mother. I mean, it’s mine, but it’s inherited. There are few things I love in this world more than food. On my not great days, it’s God, some people, food, other people. or even…God, food, forget people. I really, really love food. I love to make it, buy it, eat it, think about it, prepare it. I want it all the time. The more the better. The better the better. But for all that, I am not a food blogger. 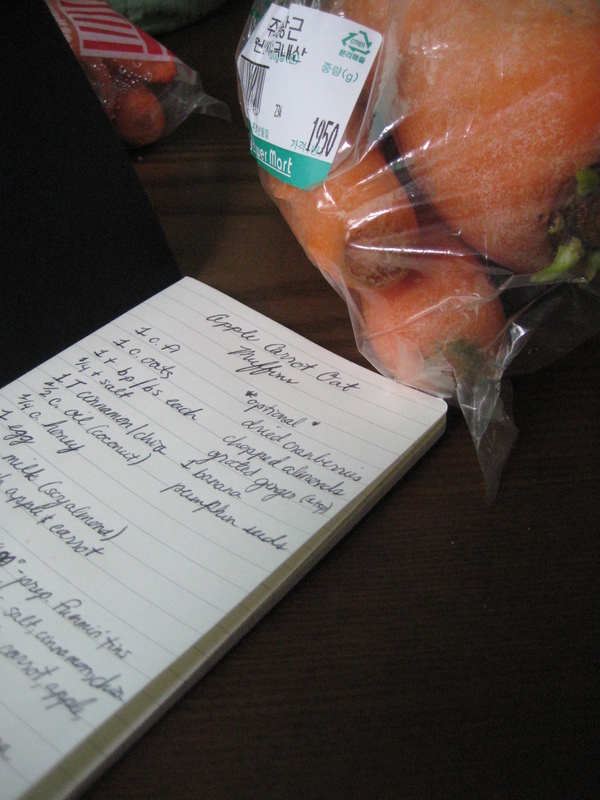 Even though this is a post about a recipe I adapted and made. I don’t have a camera or nutrition facts. I make food when I want to and not on a schedule. I have a habit of making a meal on a Monday and just recreating it for dinner til the end of time. Because it keeps being good! and generally it involves a frying pan, a chopping board, and a bowl to make and eat. Low maintenance, bebe. Okay, not nothing, but nothing perfect. Maybe it’s age and maybe it’s living where finding the right ingredients for things is a creative struggle, but it’s become more important to me to create what I imagined, rather than settling for what’s available. SO I adapted from a couple of recipes: Deb’s from Smitten Kitchen (is it creepy that I’ve read every single post on her site?) and this one from Minimalist Baker (which is new to me but I am about to begin happily stalking). So I got to work. The inclusion of the banana may have happened after everything was mixed, but looked a little dry, and I saw these and thought, sure. And it may have found its way into the batter by being hand-squleched, because I may not have felt like dirtying more dished for a lone banana. But I divulge nothing. I also may have fashioned liners out of something labeled ‘paper baking foil’ because I may not have wanted to grease all the tins all the dang time. This is a really simple recipe, and the results were fully satisfying. Because there’s such a small amount of sweetener, most of the flavor comes from the fruit, and those flavors intensify over time. That means that these are much better after you let them cool, or sit overnight. 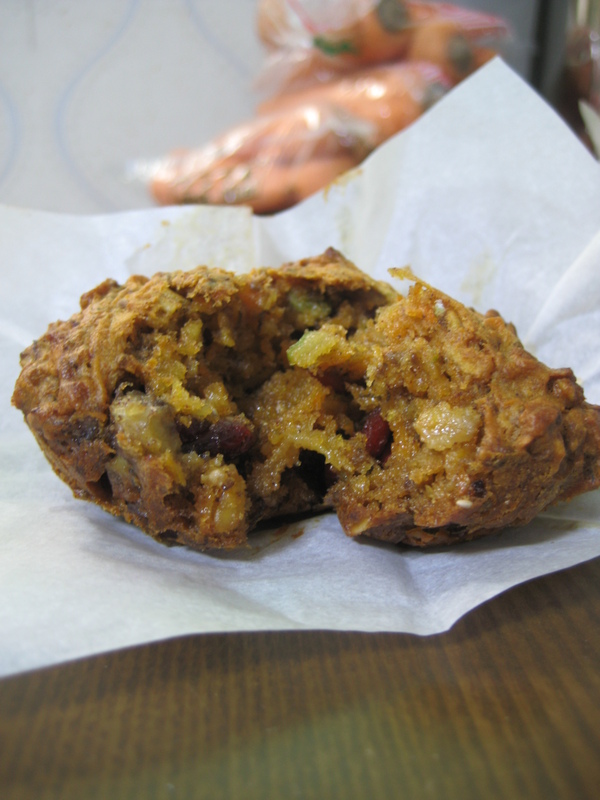 These are dense and super-textured, with the banana smoothness, the bits of carrot and apple, the burst of cranberry tang, the nutty pumpkin seeds, and the crunchy lil chia seeds that sneak into your molars. There’s a lot going on here, but this is the Little Muffin That Could. I mean…look at that lil beauty. Preheat oven to 400F/ 204C. Grease muffin tin or line with cupcake holders. Dry ingredients in one bowl, wet in another. Toss the Dries together, then vigorously mix the Wets. Then pour the Wets in with the Dries. Let madness ensue until ingredients are all moistened and comfortable about it. This is where the Optionals get to come play. Let ’em. Mix again. 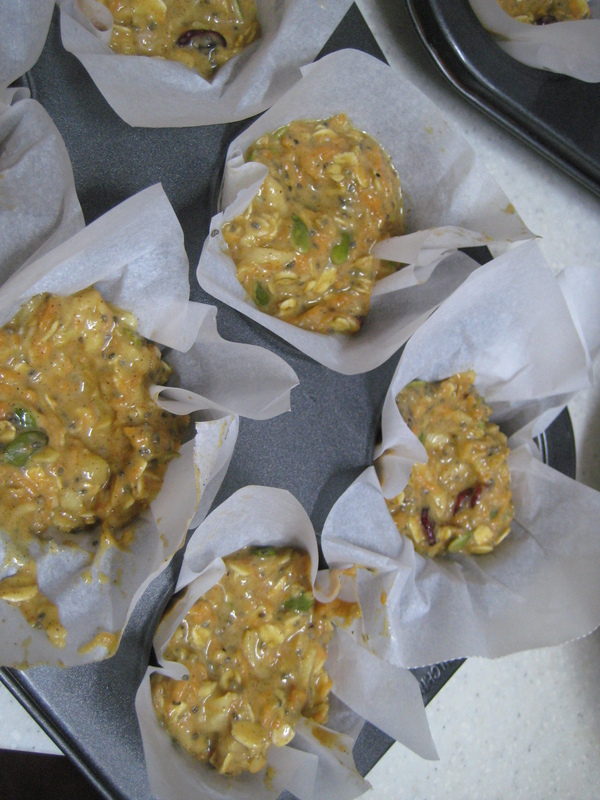 Fill greased muffin tins about half way up. These are dense lil dudes, so they don’t rise much. Bake at 400F (205C) for about 15 minutes (my oven bakes way too fast, so yours might take longer) or until a toothpick in the center comes out clean. Let cool overnight and then gorge yo’self. But beware of…ahem…fiber overload. I may have encountered that after eating five in a row. On my first date with The Boy I ordered tea. I love tea. I loved it when I read the Laura Ingalls Wilder books (it’s all Pa will drink in cold weather and now that I’m thinking about it I think he might have been my first crush? awkward live-blogged realization ). I loved it when I discovered all kinds of weird teas shoved haphazard in our old pantry because Mom was Coffee or Die, and Dad was a teacher, and teachers get weird gifts all the time. Like tea samplers. And the Eternal Christmas Tri-part Popcorn Bucket of Doom. Drinking tea made me feel fancy. Adult. Different. Like I could any second blink and be 150 years ago with cooler clothes and speech patterns and EVERYTHING. (minus, you know, plumbing indoors, and a bunch of political and social right, but WHATEVZ). Also, I was allowed to drink it. So. On my first date with The Boy I drank tea (Earl Gray), and it was discovered that The Boy DID NOT LIKE TEA. He drank coffee on the daily and had no interest at all in the wonderful world of spice and allure waiting for him in a teacup. NONE AT ALL. This was the closest thing to a red flag I encountered in our budding relationship. To change his mind, I laughed at him. It was super effective! HA no. No it wasn’t. Wasn’t at all. I tried to explain, to reason with him. Nothing. So we broke up. HA no. Boy y’all are gullible. We agreed to disagree, and I waited. Bided my time. (Bid my time? Bit? Bidden? Bought? BODE my time? help) and kept ordering tea. (and sometimes mochas.) Eventually I got him some Earl Grey of his own, and he admitted (grudgingly) that it was okay. OKAY. psh. Had he so blasphemed my beloved Irish Breakfast…well. Let’s be thankful he didn’t. This summer, the Summer of All the Problems, Nate had to make some dietary changes that included eliminating caffeine, and also, we got sick A LOT. And while caffeine-free coffee just isn’t even worth thinking about, caffeine-free tea is a different story. 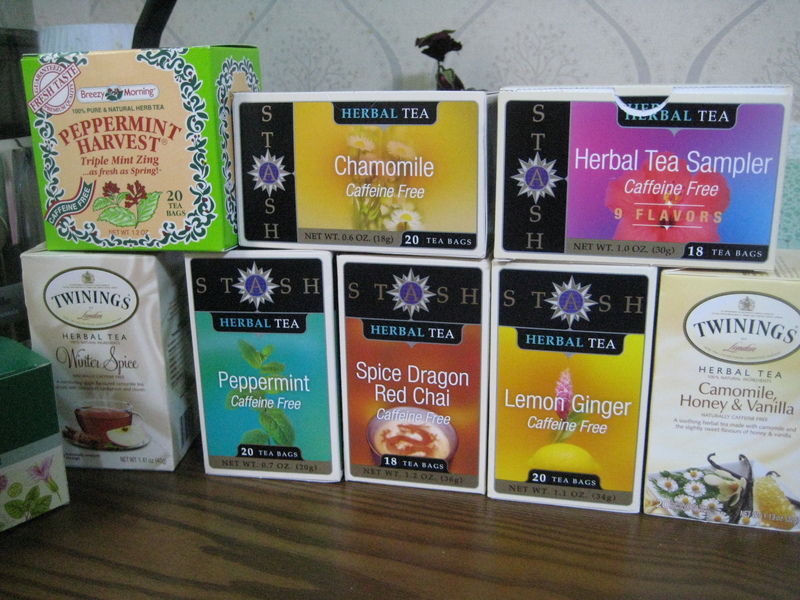 I wondered over to iHerb to check out what they had and ended up with a cart full of teas. And some organic rolled oats (Korea doesn’t do oats). And some apple cider vinegar. And peppermint extract (winter baking is coming). They do foodstuffs and cosmetics and a whole lot of ‘health supplements’ that I do not understand and consequently, fear. After waiting for the package to clear customs and getting lots of texts from the Korean post office, Nate came home with a backpack of wonder. His current favorites are peppermint and lemon ginger, with just a touch of honey. We’ll ease into the chai and ‘spice’ territories but if he hates those…more for me. He’s officially converted, you guys. Bless the Lord. Thus saith Sally, 35-years married to a pastor, mother of 10, sometime 4th-grade teacher, and purveyor of millions of bowls of oatmeal. So I didn’t. I never said never. But then came The Boy. And I retroactively realized that the never (verb) never rule applies to thinking as well. And I couldn’t be happier that I got it wrong. From our first post-engagement Bible study, lo these many moons ago. Because this guy’s got a calling from Jesus. He’s the most pastor-y person I know. He can’t help it. I married a pastor-in-training, a pastor in heart and head and all but employ. We believe that God has a place intended for him to minister…for us to minister, as much as those italics make me squirm. And the first step–scratch that. The millionth step already, in two lives full of steps, is here. “The ministry blog” we called it to ourselves, during the 2014 Spring of Planning that became the 2014 Summer of Inevitable Delays. The labor of love from the girl who spent years blogging sporadically about things that didn’t matter at all, and The Boy with a gift for saying things that matter very much but to whom ‘blog’ was a sound you made about food you disliked. But it’s real, and it’s up, and the words God gives The Boy every week are for everyone to read. Now it’s called Mobile Word. Because the Gospel isn’t static but dynamic. Made to move. Just like we are. 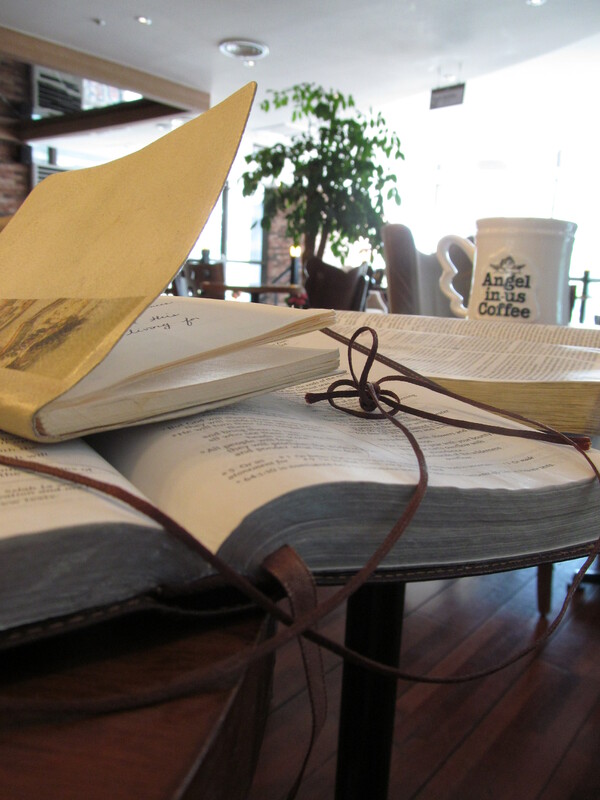 Devotionals every Tuesday, reflections on the Word and the Walk every Thursday. Go and read. And may it bless you the very most. Late summer, you charmer. You knew I’d be running again and you put on a show for me. Don’t deny it. You want me to notice everything and you’re not afraid to show off. In fact…you’re a bit of a hussy. That sun, just barely still sizzly on my shoulders? I see you. Roadside flowers, lavender and golden-yellow and bright white, nodding on tall, slender stems? Oh please. You know exactly what you’re up to. And don’t get me started, morning glories. True-blue sky, shot through with sunbeam-strewn, mile-high clouds? Keep it coming. We both know this isn’t gonna last and that you might not even be around tomorrow. But wouldn’t you agree we had it good while it lasted? I know I would.